Today I went on some errands, one of which involved a trip to the RE Store in Ballard for some reclaimed wood bits to use in making the door and fireplace frame. I found some lovely bits of lath that looked nice and aged (perfect because he used boards from the railroad worker’s shanty to make the door, so they would have been weathered and well-worn). They were all bundled together, though, because they matched, and there was much more than I needed, and more than would fit in the car (some bits were really long). So I found a nice guy who worked there and asked him if I had to buy a whole bundle of lath if the bits were tied together, or if I could just take what I needed, and he said I could take what I needed and leave the rest. So I went and got a few smaller strips and went back to the front to pay. He came to the counter to help me, glanced at the strips I had, and said “A quarter…”. I figured perhaps he meant that I had taken a quarter of the bundle, and got out my wallet and debit card while I waited for him to ring me up. I smiled encouragingly, as if to say “Yes, I’ve taken a quarter of the bundle” thinking perhaps he had meant his statement as more of a question, but not sure enough to try and answer out loud. Then I got it, and replied “Oh! You mean, like, an ACTUAL QUARTER. Sorry!” and proceeded to grab my change purse and carefully hand him one quarter, which he dropped into a cup on the counter. And that’s how I learned that six feet of used lath at the RE Store costs 25 cents. Author Shasti WalshPosted on 12 August, 2012 30 January, 2018 Categories WaldenLeave a comment on A Quarter. Do you see a king-post in the picture? An “entire tree, extending from the bottom of the cellar to the ridge-pole”? A central support beam? No. Well, I wanted as much authenticity as possible, so of course I wanted to put in a king-post — but then I decided against, since the king-post would sort of impede the whole ‘library’ part of the project, and get in the way of the books. It was a quandary. Dad to the rescue! I called him and told him about the king-post problem, and he had a great solution: he suggested I attach a section of replica king-post to the ceiling, but just a short bit that wouldn’t get in the way of books. Then he suggested I carve a slight depression in the floor where the king-post would be, and mark it somehow, perhaps by burning it. Brilliant! So I did exactly that. I cut a piece of the pine tree in my back yard (pine tree! Just like Thoreau’s king-post would [most likely] have been — though a different kind of pine). Then I cut a small indentation in the ceiling, exactly matching the outline of the post, and glued it in (so it looks like it comes out of the ceiling rather than just looking stuck-on). I hollowed out a slightly larger (since trees are bigger at the bottom) round indentation in the middle of the floor, and burned it with my woodburning tool. 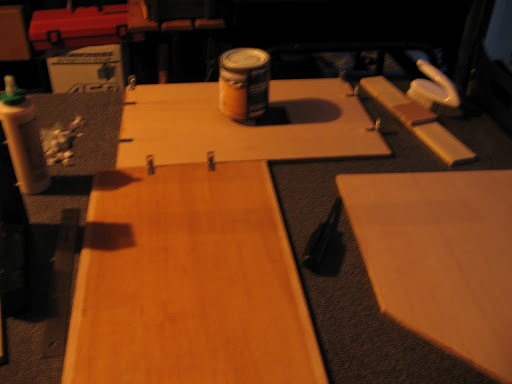 The plywood… I kinda messed up on the plywood, so here’s hoping it will all be fine. I wanted exterior plywood, because that’s what my research said to use, but then the plywood at Home Depot wasn’t very well labeled, and the helpful man in the hardwood section said that all plywood could be used outside as long as you seal it, and that I didn’t need the ugly green pressure-treated plywood and I shouldn’t use that anyway if people were going to be touching the end result. So I bought a sheet of pretty plywood, 1/2″ thick, sanded on both sides, 5-ply laid crossways as usual, and it looks like white pine so there’s that. But then I read up on the brand (Sandeply by Endesa) later and learned that it’s interior-grade plywood, which means the glue that holds the plys together isn’t rated for outdoor conditions. Also it’s not white pine or anything similar, but a mix of tropical hardwoods. It’s made in Ecuador. Their website talks a lot about how great they are and how much they care about the environment and sustainable forestry, but it’s their website so who knows. So yeah, the wood isn’t ideal. But it’s very pretty, and I got it all cut up (except for the roof bits, because Home Depot apparently can’t cut angles), and I took it home and sanded it all up nicely and got it ready for sealing. I also deeply confused the guy in the paint section. First I brought him a can of exterior sealant and asked a ton of questions about it (that started with “it says ‘transparent’ but it comes in ‘natural’ ‘cherry’ and ‘oak’ — so is it transparent, or not?”). Then I started asking about the ‘Venetian Plaster’ line of the Martha Stewart line, and when I learned that didn’t come in white, I wanted to know what color authentic limestone plaster was, and what I should buy that would have both that color and that effect… he wanted to know if I needed interior paint or exterior paint, and I responded with something like “well, it will be inside, but inside a little structure that will be outside, but it should be weatherproof, but it won’t be heated, and it might get hot sometimes, and also it can’t be shiny because it has to look like plaster but also there will be books, so it can’t rub off easily…” He didn’t really know what to do with me. Then I was told later that Home Depot didn’t have the screws I needed (exterior grade wood screws but very short), but that there is a screw-specific store in Ballard that I should visit. So this weekend I’m going to an entire store that sells nothing but screws and fasteners. It sounds pretty rad. Side note: sanding wood makes a lot of sawdust. This might seem obvious, and I knew that sawdust would happen, but I thought that if I laid down a nice big drop-cloth it would be fine, and since I was doing it late at night I didn’t want to be out in the garage, I wanted to be in my living room, working on my project while watching some nice Science Channel educational programming and leaning on my couch. So that’s what I did, and the drop-cloth worked great and all, but then afterward I realized that there is now a fine layer of very fine sawdust all over EVERYTHING in my house. Like, really, everything. Everywhere. So, you know, consider yourself warned, the next time you think that sanding down some plywood in your living room is a good idea, because it’s not. Also I learned later that some wood, like mahogany, is actually poisonous so you don’t want to breathe in that sawdust. And I think the glue that holds plywood together is also probably almost certainly cancer-causing or something, and probably shouldn’t be inhaled or spread liberally over your entire living space in the form of a fine powder. But, you know, whatever. 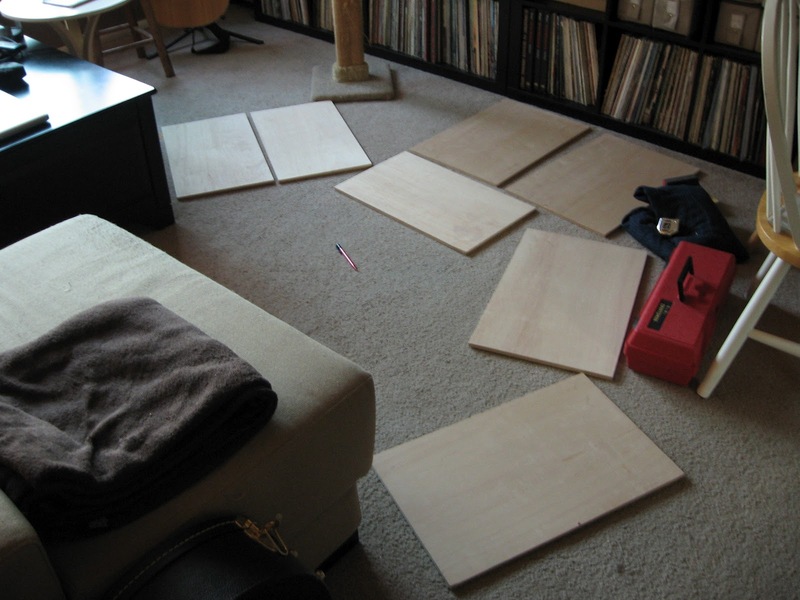 End result: beautiful plywood, ready for phase two: sealing! So… how exactly does one build a mini Walden? There are so many details to consider! I wanted to use a mix of new and reclaimed wood (as Thoreau did: he used a mix of trees he cut himself and boards/nails from a railroad worker’s shanty that he bought and tore down). I also, however, wanted it to be very specific: to scale, and ideally authentic down to the type of wood (Thoreau used a mix of white pine and possibly cedar). Reclaimed wood is hard to find in exact sizes, it turns out, and I lack both tools and skills to turn a pile of randomly-sized bits and boards into exact components of a very specific little house. Reclaimed wood also has a tendency to be warped and such, which makes it that much harder to fit all the pieces together and have it not leak. 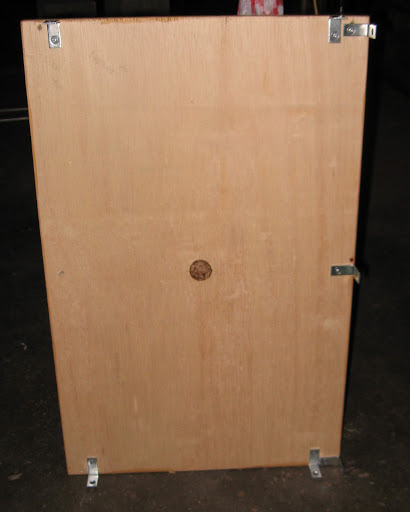 Plywood, on the other hand, is nice and flat and consistently thick, and comes from Home Depot where there are many helpful gentlemen who are happy to cut it up into very specific bits for you. This is handy when all you have to work with is a hand saw, a ruler, and a [very professional] pencil. On the other hand, this is when it started to get really fun. I began sourcing various decorative materials online. I found miniature dollhouse shingles made from white pine for the walls, and cedar for the roof! Perfect! My dad came down for the day and we did a lot of sketching and math to figure out exactly what we needed. How would we make the side of the house that would open to provide access to the books? What would we use for tar paper on the roof? Actual tar paper? Something else? How would we affix the shingles to the house and to the roof (it’s pretty impossible to nail down a 1″x1″x1/16″ shingle)? What would the house rest on? Would we also build the woodshed, which was essential for Thoreau, even though it was detached from the cabin? Etc. I collected quotes from Thoreau on the subject of his house-building (he was a great writer, but Walden is hardly a builder’s guide — he can be excruciatingly specific about one thing, like the cost of bricks, and then maddeningly general about something else, like where exactly the trap door into the root cellar was located or how he shingled the roof). We decided to look at Thoreau’s collected journals, which will hopefully have a lot more detail. I decided to build the chimney and fireplace out of wood, and paint it to look like brick. 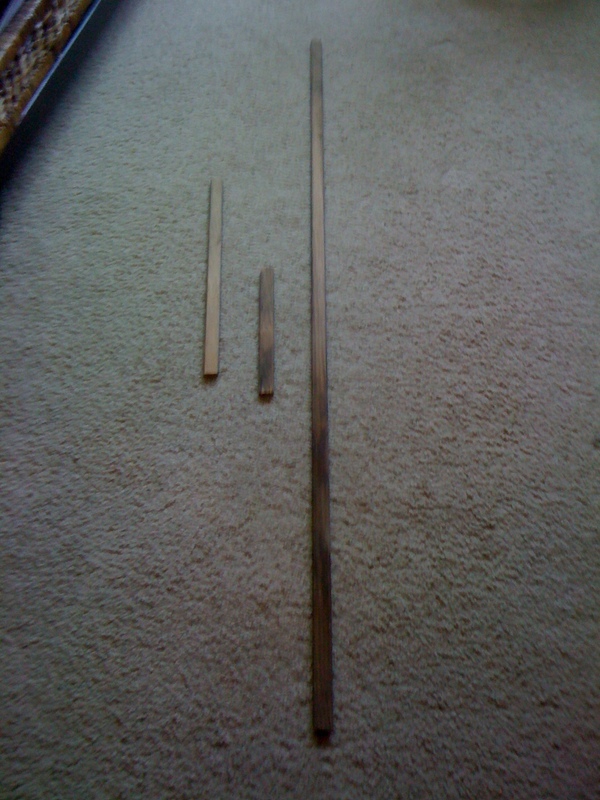 Later I found super-awesome 1.5″ square by about 3′ long cedar stake things, with a 45 degree angle cut at the end, so I bought two and plan to cut down the ends with the angle cuts for the fireplace and affix them to a longer piece from the square end in the middle as the chimney. I’ll screw/glue them together, then I’ll use my dremel tool to etch the bricks into the wood, then I’ll use brick-colored paint mixed with a fine pumice gel medium for texture and paint the whole thing, then I’ll use my woodburning tool to burn out the top center of the chimney for effect, then I’ll use a pick to scrape the paint out of the etched brick spaces (re-dremeling if needed), then I’ll seal the whole thing with a waterproofing sealant and screw it down to the base platform behind the house. Things like this get me super excited these days. This chimney is going to be AMAZING! Author Shasti WalshPosted on 25 July, 2012 30 January, 2018 Categories WaldenLeave a comment on So… how exactly does one build a mini Walden? Alright, first post, breaking ground! Starting at the beginning, and jumping right in…. I read it and of course loved the idea and then, of course, had to build my own. I haven’t really built anything out of wood since I was about seven years old, though, and that was a bookshelf that I built with my dad. And by “built with my dad” I mean handed him tools and screws and things, and helped decide how big it should be, and then when it was finished stuck unicorn stickers all over it. Like I said, I was seven. It was a pretty great bookshelf, though, so I figured it would be a great father-daughter project for us to build a library together — and if my dad helped, it might actually turn out plumb and weatherproof. Win! So. The Idea Was Born. We browsed the Little Free Library homepage for a few days, looking at examples and plans, and I got out a pencil (I haven’t really used a pencil since college, I much prefer pens, but pens aren’t The Thing when you’re Doing Construction, so I decided to go pro and use a pencil) and started sketching things. It was great. In my dad’s pickup truck, there was a workbox. He had made it himself — it was a big plywood box with a hinged lid that fit between the two front seats, and it had all his work stuff in it: notebooks, and pencils (see? Pencils! Super pro! ), and labels from spray cans, and a little reference book that had Everything about Everything (it was awesome, now I have one too), and a calculator, and a ruler I think, and graph paper, and a multi-tool, and some other tools and wrenches and things, and lots of other things I can’t really remember. It was really cool, and he had all sorts of Useful Things in the workbox. Also it doubled as my booster seat in the pickup truck, because I was little and I couldn’t see out the window when I sat on the seat. One of the things in the workbox, along with all the tools and practical things, was a little green book. It was a tiny copy of Walden; Or, Life in the Woods by Henry David Thoreau. I was too little to read it, but I loved it anyway, and I took it as an obvious fact that it was every bit as essential to his job as Orchard Manager, Dad, and Generally Amazing Person Who Could Build and Fix Anything as a screwdriver, calculator or wrench. Yeah, my dad is a pretty awesome guy. So Walden has been part of my life for nearly as long as I can remember. I didn’t read it until I was much older, but when I did, it became part of my canon and one of my desert island books, too. So it was obvious, really, that the first house I was building (library, whatever, a library is a house for books and that’s every bit as much a house as a people-house), and the first BUILDING I was really truly building, and the first woodworking project for my dad and I since I was a little girl… well, of course I was going to build my own Walden. There was really, as I told my dad when I called him later that evening, no other possible option.